We are custodians of a sacred estate dedicated to the Goddess. We have had gatherings and ceremonies on the land and in the Temple in honor of the Goddess. We seek to extend our capability to do this work by erecting several yurts and their wooden decks, which were donated to the Temple. 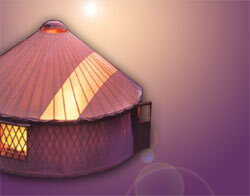 Yurts are modern day versions of Mongolian tents. We are seeking contributions totaling $64,000 to put up the decks and yurts. Your donation would help the work of bringing Goddess consciousness and the wisdom of the heart to the planet. Please donate generously so that we may continue to build this network of light and love called the Goddess Temple. The yurts will serve the community and provide the means to offer retreats and initiations into Goddess energy and consciousness. People coming here will be able to tune in to the energy field and receive the abundance and blessings this sacred land has to offer.